Qatar is backing plans for talks with its regional rivals as a diplomatic row gathers pace. Meanwhile, US President Donald Trump has said he was told during his recent visit to Saudi Arabia that Qatar was funding "radical ideology". "During my recent trip to the Middle East I stated that there can no longer be funding of Radical Ideology. Leaders pointed to Qatar - look!" he tweeted. In an interview with Qatar's al-Jazeera network, the Qatari foreign minister said Kuwait's emir would travel to Saudi Arabia on Tuesday for talks. Sheikh Mohammed Bin Abdulrahman al-Thani told Al Jazeera that Qatar was seeking "a dialogue of openness and honesty". Six countries - Bahrain, Saudi Arabia, the UAE, Yemen, Libya's eastern-based government and the Maldives - cut diplomatic ties with Qatar on Monday. Bahrain, Saudi Arabia and the UAE have given Qatari nationals two weeks to leave, and banned their own citizens from travelling to Qatar. 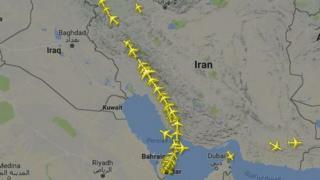 Saudi Arabia, Bahrain and the UAE closed all transport links by air, land and sea. The UAE and Egypt expelled Qatari diplomats, giving them 48 hours to leave, and Saudi Arabia closed down a local office of al-Jazeera. 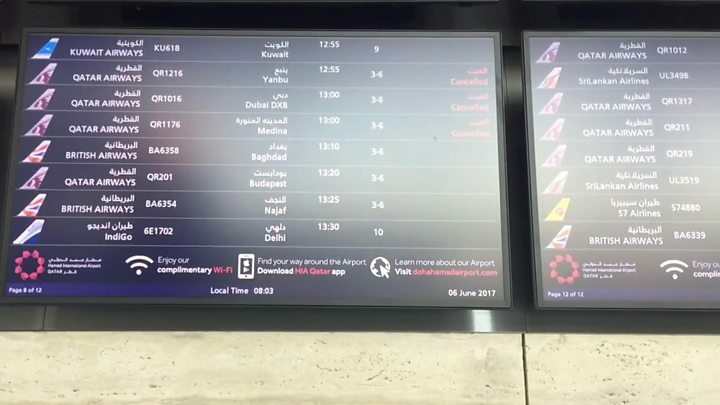 Airlines affected by the airspace restrictions include Qatar Airways, Etihad Airways and Emirates. On Tuesday, Saudi Arabia revoked Qatar Airways' licence and ordered the company's Saudi offices to shut within 48 hours. "People have stormed into the supermarket hoarding food, especially imported ones," one Doha resident, Eva Tobaji, told Reuters. "It's chaos - I've never seen anything like this before." The Financial Times also reports that Gulf allies were angry that Qatar paid a $1bn (£773m) ransom to jihadists and Iranian security officials after Qatari nationals were kidnapped in Iraq and Syria. Analysts also say the timing of the diplomatic withdrawal, two weeks after a visit to Riyadh by President Trump, is crucial. Mr Trump's speech in Saudi Arabia, in which he blamed Iran for instability in the Middle East and urged Muslim countries to take the lead in combating radicalisation, is likely to have emboldened Gulf allies to act against Qatar. In the same week as Mr Trump's speech, Egypt, Saudi Arabia, Bahrain and the UAE blocked Qatari news sites, including al-Jazeera. Comments purportedly by Qatar's Emir, Sheikh Tamim bin Hamad al-Thani, criticising Saudi Arabia had appeared on Qatari state media. The government in Doha dismissed the comments as fake, attributing the report to a "shameful cybercrime". 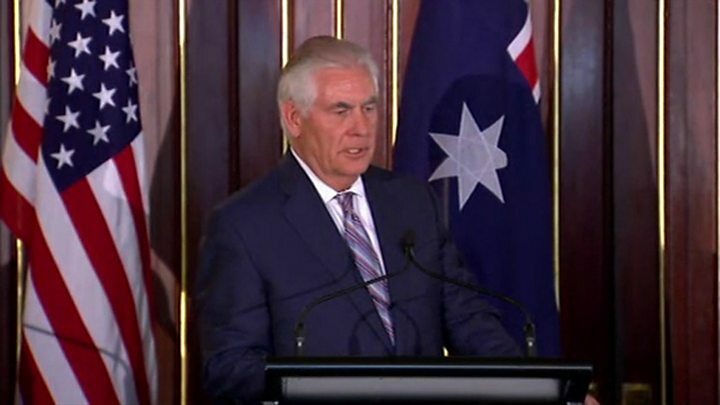 Media captionUS Secretary of State Rex Tillerson urges Gulf states to "address differences"
In the interview with al-Jazeera, Foreign Minister Sheikh Mohammed Bin Abdulrahman al-Thani said Qatar would not retaliate but was unhappy with regional rivals "trying to impose their will on Qatar or intervene in its internal affairs"
Philippines labour official Silvestre Bello told a new conference he feared Filipinos in Qatar would "be the first victims" in the event of riots over food shortages.